The cover of the first light novel volume. 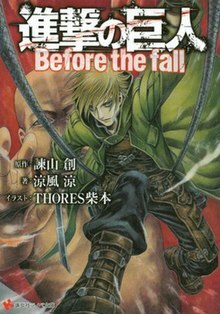 Attack on Titan: Before the Fall (進撃の巨人 Before the fall, Shingeki no Kyojin: Before the Fall) is a series of Japanese light novels written by Ryō Suzukaze and illustrated by THORES Shibamoto. The three novels were published in 2011 and 2012. The series is a prequel to Hajime Isayama's Attack on Titan manga. A manga adaptation by Satoshi Shiki was serialized between 2013 and 2019. The series is set 70 years before the events of Attack on Titan, and is divided into two parts: the first focuses on Angel Aaltonen, the developer of the Vertical Maneuvering Equipment; the second part follows the life of Kuklo, a boy who was found as a baby in a pile of Titan vomit, having been birthed by one of the Titan's victims after they were eaten. He is labelled the "Titan's son" and imprisoned for many of his younger years, before being freed by his owner's daughter, Sharle, and eventually joining the Survey Corps. The series of light novels is written by Ryō Suzukaze, with illustrations by THORES Shibamoto. Three volumes were released between 2011 and 2012. It serves as a prequel to the Attack on Titan manga, written and illustrated by Hajime Isayama. The series was licensed in North America by Vertical, who published the first volume in summer 2014, followed by the second and third volumes in a 2-in-1 omnibus format in summer 2015. Attack on Titan: Before the Fall 3 part novel series begins with Volume 1 named Attack on Titan: Before the Fall, Volume 2 is Marching Giants and Volume 3 is Kuklo Unbound. The English version combines Volumes 2 and 3 into Kuklo Unbound. A manga adaptation, written by Suzukaze and illustrated by Satoshi Shiki, was published in Kodansha's Monthly Shōnen Sirius magazine from August 26, 2013 to March 26, 2019 and was collected in seventeen volumes. The series received a special chapter in the May issue of Monthly Shōnen Sirius on March 25, 2014. Kodansha USA announced in October 2013 that it had licensed the series, and began releasing it in North America in spring 2014. The manga had 1.4 million copies in print in August 2015. Volume one was on the list for five non-consecutive weeks: for the first two weeks it ranked at number one. Volume two was on the list for one week at fifth place. Volume three was on the list for one week at fourth place. Volume four was on the list for two weeks, ranking at fourth and eighth place, respectively. Volume seven was on the list for one week, ranking at fourth place. Reviewing the first novel for Anime News Network, Rebecca Silverman called it "well-written, engrossing, and with the feel of historical fiction rather than fantasy". She wrote that "Suzukaze's writing style is very visual ... the prose can make your stomach churn and hair stand on end, not so much in a straight horror way, but more in the sense of a nightmare coming true when you had convinced yourself that it was just a dream." She concluded by saying "If you aren't tired of Attack on Titan or perhaps just want a boost to flagging interest, Before the Fall is absolutely worth reading", and gave the book a grade of A−. Reviewing the second, omnibus volume, she also gave it a grade of A−, calling the book "an exciting read that requires little prior knowledge of the AoT world." She was critical of the fact that "Sharle, who begins as a promising character, is woefully underdeveloped and underutilized", but concluded her review by saying that the story "gives us what the original manga does in novel form, and there really isn't much higher praise that an adaptation can get than that." ^ a b c "Vertical Adds Attack on Titan: Before the Fall Light Novel Series". Anime News Network. October 11, 2013. Retrieved October 9, 2015. ^ a b Silverman, Rebecca (September 25, 2014). "Attack on Titan: Before the Fall Novel 1". Anime News Network. Retrieved October 9, 2015. ^ a b Green, Scott (August 20, 2013). ""Attack on Titan: Before the Fall" Prequel Manga Launches Next Week". Crunchyroll. Retrieved October 9, 2015. ^ a b Silverman, Rebecca (May 29, 2015). "Attack on Titan: Before the Fall Novel 2 - Kyklo". Anime News Network. Retrieved October 9, 2015. ^ Green, Scott (October 11, 2013). "Vertical Announces "Attack on Titan" Light Novels". Crunchyroll. Retrieved October 9, 2015. ^ "Vertical Licenses More Attack on Titan Light Novels". Anime News Network. October 11, 2014. Retrieved October 9, 2015. ^ Green, Scott (October 12, 2014). "Vertical Announces "Attack on Titan: Harsh Mistress of the City" Light Novel". Crunchyroll. Retrieved October 9, 2015. ^ 進撃の巨人　Ｂｅｆｏｒｅ　ｔｈｅ　ｆａｌｌ [Attack on Titan: Before the Fall]. Kodansha (in Japanese). Retrieved October 9, 2015. ^ "Attack on Titan: Before the Fall (Novel)". Penguin Random House. Retrieved October 9, 2015. ^ 進撃の巨人　Ｂｅｆｏｒｅ　ｔｈｅ　ｆａｌｌ２ [Attack on Titan: Before the Fall 2]. Kodansha (in Japanese). Retrieved October 9, 2015. ^ a b "Attack on Titan: Kuklo Unbound". Penguin Random House. Retrieved October 9, 2015. ^ 進撃の巨人　Ｂｅｆｏｒｅ　ｔｈｅ　ｆａｌｌ３ [Attack on Titan: Before the Fall 3]. Kodansha (in Japanese). Retrieved October 9, 2015. ^ "Daphne in the Brilliant Blue's Shiki Penning Attack on Titan Spinoff Manga (Updated)". Anime News Network. August 20, 2013. Retrieved October 9, 2015. ^ a b "Kodansha Comics Adds Attack on Titan: Before the Fall, No Regrets Spinoff Manga". Anime News Network. October 11, 2013. Retrieved October 9, 2015. ^ "3 Attack on Titan Spin-Off Manga Series Get Special Chapters in Sirius". Anime News Network. February 26, 2014. Retrieved October 9, 2015. ^ 進撃の巨人　Ｂｅｆｏｒｅ　ｔｈｅ　ｆａｌｌ（１） [Attack on Titan: Before the Fall (1)]. Kodansha (in Japanese). Retrieved October 9, 2015. ^ "Attack on Titan: Before the Fall 1". Penguin Random House. Retrieved October 9, 2015. ^ 進撃の巨人　Ｂｅｆｏｒｅ　ｔｈｅ　ｆａｌｌ（２） [Attack on Titan: Before the Fall (2)]. Kodansha (in Japanese). Retrieved October 9, 2015. ^ "Attack on Titan: Before the Fall 2". Penguin Random House. Retrieved October 9, 2015. ^ 進撃の巨人　Ｂｅｆｏｒｅ　ｔｈｅ　ｆａｌｌ（３） [Attack on Titan: Before the Fall (3)]. Kodansha (in Japanese). Retrieved October 9, 2015. ^ "Attack on Titan: Before the Fall 3". Penguin Random House. Retrieved October 9, 2015. ^ 進撃の巨人　Ｂｅｆｏｒｅ　ｔｈｅ　ｆａｌｌ（４） [Attack on Titan: Before the Fall (4)]. Kodansha (in Japanese). Retrieved October 9, 2015. ^ "Attack on Titan: Before the Fall 4". Penguin Random House. Retrieved October 9, 2015. ^ 進撃の巨人　Ｂｅｆｏｒｅ　ｔｈｅ　ｆａｌｌ（５） [Attack on Titan: Before the Fall (5)]. Kodansha (in Japanese). Retrieved October 9, 2015. ^ "Attack on Titan: Before the Fall 5". Penguin Random House. Retrieved October 9, 2015. ^ 進撃の巨人　Ｂｅｆｏｒｅ　ｔｈｅ　ｆａｌｌ（６） [Attack on Titan: Before the Fall (6)]. Kodansha (in Japanese). Retrieved October 9, 2015. ^ "Attack on Titan: Before the Fall 6". Penguin Random House. Retrieved October 9, 2015. ^ 進撃の巨人　Ｂｅｆｏｒｅ　ｔｈｅ　ｆａｌｌ（７） [Attack on Titan: Before the Fall (7)]. Kodansha (in Japanese). Retrieved December 17, 2015. ^ "Attack on Titan: Before the Fall 7". Penguin Random House. Retrieved October 9, 2015. ^ 進撃の巨人　Ｂｅｆｏｒｅ　ｔｈｅ　ｆａｌｌ（８） [Attack on Titan: Before the Fall (8)]. Kodansha (in Japanese). Retrieved April 7, 2016. ^ "Attack on Titan: Before the Fall 8". Penguin Random House. Retrieved March 23, 2016. ^ 進撃の巨人　Ｂｅｆｏｒｅ　ｔｈｅ　ｆａｌｌ（９） [Attack on Titan: Before the Fall (9)]. Kodansha (in Japanese). Retrieved August 5, 2016. ^ "Attack on Titan: Before the Fall 9". Penguin Random House. Retrieved August 9, 2016. ^ "進撃の巨人　Ｂｅｆｏｒｅ　ｔｈｅ　ｆａｌｌ（１０）" [Attack on Titan: Before the Fall (10)]. Kodansha (in Japanese). Retrieved December 5, 2016. ^ "Attack on Titan: Before the Fall 10". Penguin Random House. Retrieved August 9, 2016. ^ "進撃の巨人　Ｂｅｆｏｒｅ　ｔｈｅ　ｆａｌｌ（１１）" [Attack on Titan: Before the Fall (11)]. Kodansha (in Japanese). Archived from the original on April 7, 2017. Retrieved June 26, 2017. ^ "Attack on Titan: Before the Fall 11". Penguin Random House. Retrieved August 9, 2017. ^ "進撃の巨人　Ｂｅｆｏｒｅ　ｔｈｅ　ｆａｌｌ（１２）" [Attack on Titan: Before the Fall (12)]. Kodansha (in Japanese). Archived from the original on August 9, 2017. Retrieved July 26, 2017. ^ "Attack on Titan: Before the Fall 12". Penguin Random House. Retrieved January 9, 2018. ^ "進撃の巨人　Ｂｅｆｏｒｅ　ｔｈｅ　ｆａｌｌ（１３）" [Attack on Titan: Before the Fall (13)]. Kodansha (in Japanese). Archived from the original on December 9, 2017. Retrieved December 26, 2017. ^ "Attack on Titan: Before the Fall 13". Penguin Random House. Retrieved January 19, 2018. ^ "進撃の巨人　Ｂｅｆｏｒｅ　ｔｈｅ　ｆａｌｌ（１４）" [Attack on Titan: Before the Fall (14)]. Kodansha (in Japanese). Archived from the original on June 15, 2018. Retrieved June 15, 2018. ^ "Attack on Titan: Before the Fall 14". Penguin Random House. Retrieved May 19, 2018. ^ "進撃の巨人　Ｂｅｆｏｒｅ　ｔｈｅ　ｆａｌｌ（１５）" [Attack on Titan: Before the Fall (15)]. Kodansha (in Japanese). Archived from the original on July 31, 2018. Retrieved July 31, 2018. ^ "Attack on Titan: Before the Fall 15". Penguin Random House. Retrieved June 15, 2018. ^ "進撃の巨人　Ｂｅｆｏｒｅ　ｔｈｅ　ｆａｌｌ（１６）" [Attack on Titan: Before the Fall (16)]. Kodansha (in Japanese). Archived from the original on December 7, 2018. Retrieved January 31, 2019. ^ "Attack on Titan: Before the Fall 16". Penguin Random House. Retrieved February 3, 2019. ^ "進撃の巨人　Ｂｅｆｏｒｅ　ｔｈｅ　ｆａｌｌ（１７）" [Attack on Titan: Before the Fall (17)]. Kodansha (in Japanese). Archived from the original on March 30, 2019. Retrieved March 30, 2019. ^ "Attack on Titan: Before the Fall 17". Penguin Random House. Retrieved March 30, 2019. ^ "Attack on Titan: Before the Fall Manga Has 1.4 Million Copies in Print". Anime News Network. August 8, 2015. Retrieved October 9, 2015. "Best Sellers - Manga". The New York Times. March 30, 2014. Retrieved October 9, 2015. "Best Sellers - Manga". The New York Times. April 6, 2014. Retrieved October 9, 2015. "Best Sellers - Manga". The New York Times. April 13, 2014. Retrieved October 9, 2015. "Best Sellers - Manga". The New York Times. April 20, 2014. Retrieved October 9, 2015. "Best Sellers - Manga". The New York Times. May 4, 2014. Retrieved October 9, 2015. ^ "Best Sellers - Manga". The New York Times. September 7, 2014. Retrieved October 9, 2015. ^ "Best Sellers - Manga". The New York Times. December 28, 2014. Retrieved October 9, 2015. "Best Sellers - Manga". The New York Times. April 19, 2015. Retrieved October 9, 2015. "Best Sellers - Manga". The New York Times. April 26, 2015. Retrieved October 9, 2015. ^ "Best Sellers - Manga". The New York Times. May 1, 2016. Retrieved April 22, 2016. This page was last edited on 31 March 2019, at 14:20 (UTC).